Lon Strickler of Phantoms and Monsters was contacted recently by a witness who said he saw a winged creature perched on his neighbor’s roof in the spring of 2010. "[The witness] heard my live [April 1st] interview with Mancow on WLS Radio in Chicago," said Strickler. I believe I may have seen one about 10 years ago in far west Joliet. It was about 2:00 AM end of March beginning of April. I was watching TV with the window open slightly. I kept hearing a muffled cry almost like a woman crying in the distance. I finally decided to take a look and see what it was. I was looking all over the backyard and neighboring yards but didn’t see anything. When I was about to give up I heard it again. I noticed that it was coming from above me. I looked up and notice something about 4 feet tall sitting on the peak of the house behind me. I grabbed my phone to take a picture but when I was about to take the picture it turned its head to look at me. It scared the crap out of me. Then it dropped like it fell. Right before it hit the ground its wings came out and it swooped away. I couldn’t believe how big the wingspan was. Strickler was able to interview the witness over the phone. "I talked to [the witness] by telephone [on April 4th]," Strickler said. "He believes it was the early spring of 2010 near County Road and Black Road in west Joliet, Illinois. [He] states he heard what sounded like a woman crying at around 2 a.m. local time. 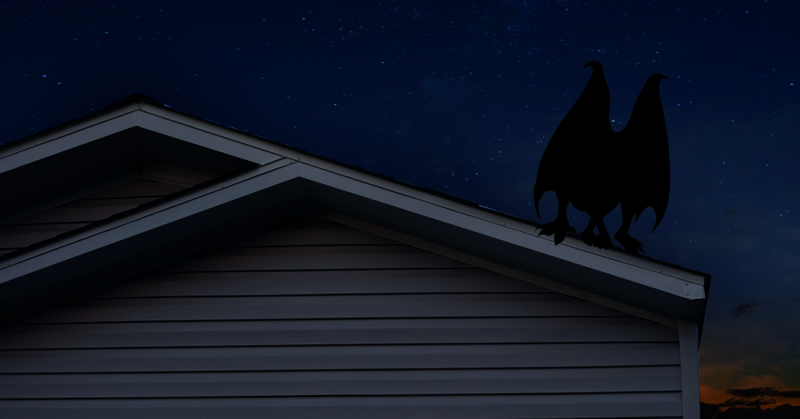 After awhile he looked out the back window and noticed a four-and-a-half-foot dark-colored entity perched on the peak of his neighbor's roof. The being was crouched down and reminded [him] of a Gargoyle. He grabbed his phone to take a photo but was instantly halted when the being looked in his direction. [The witness] said he didn't see the eyes, but 'knew' it was looking at him and that he was terribly frightened. In fact, he dropped his phone in shock." "The winged being stood and leaped from the roof, then dove towards the ground," he continued. "As it descended, the huge 10-12 foot wings unfurled as it swooped upwards and quickly ascended into the night sky. [The witness] never saw the wings flap as the being ascended. He did notice that it had pointed ears, but could not make out any further features on the face. The wings were attached from the shoulders to the legs and did not seem to have detached arms." Investigator Tobias Wayland from the Singular Fortean Society called the witness to confirm his report, but was forced to leave a voicemail. This article will be updated if and when a response is received. Joliet, Illinois is about 30 miles southwest of Chicago, and approximately 35 miles from Lake Michigan. The city is divided by the Des Plaines River, and bordered by plains and wetlands to the south.